Many stories up at NBC Studios in Rockefeller Center in New York City, Seahawks quarterback Russell Wilson sat in studio 6B with comedian and host of The Tonight Show, Jimmy Fallon, as Wilson appeared as a guest on the show last Friday. The six-time Pro Bowler was asked about a range of things from his recent travels to Brazil all the way to one of his football camps, the Russell Wilson Passing Academy (RWPA). When asked about the Passing Academy, Wilson went into detail describing where the idea came from to begin the camp and what his intention is behind it. He talked about how when they first started, they had “about 150 kids at our first camp. And now we’ve coached over 10,000 kids around the country and around the world, it’s been amazing.” An applause from the studio audience suddenly broke out, as it was obvious that there were Russell Wilson (and probably Seahawks) fans in the room. As listed on the RWPA website, the purpose of the camp “is to help children ages 8-17 develop the fundamental skills of being a great football players through instruction, but our objective is much greater.” In addition to the Passing Academy, Wilson also hosts a year-round football camp geared towards quarterbacks, called the ‘Russell Wilson Quarterback Academy’ or RWQA. Aside from the sit-down interview with Fallon, the Seahawks quarterback participated in a passing challenge where the television host tossed up random objects for Wilson to hit with a football. Some of the objects were things you may expect like glass plates and cake, but then there were some totally random, one-off items like a Lego house and a Shamrock Shake. Guest starring on The Tonight Show adds to the long list of offseason activity for Wilson. Today’s ‘Social Post of the Day’ comes from the New York Yankees, as they feature Seahawks quarterback Russell Wilson hanging out in the dugout at their spring training. Seahawks.com’s John Boyle reports on the Seahawks re-signing guard D.J. Fluker last Friday. Bob Condotta at The Seattle Times and John Clayton from 710 ESPN Seattle both analyze the Seahawks’ first week of free agency. 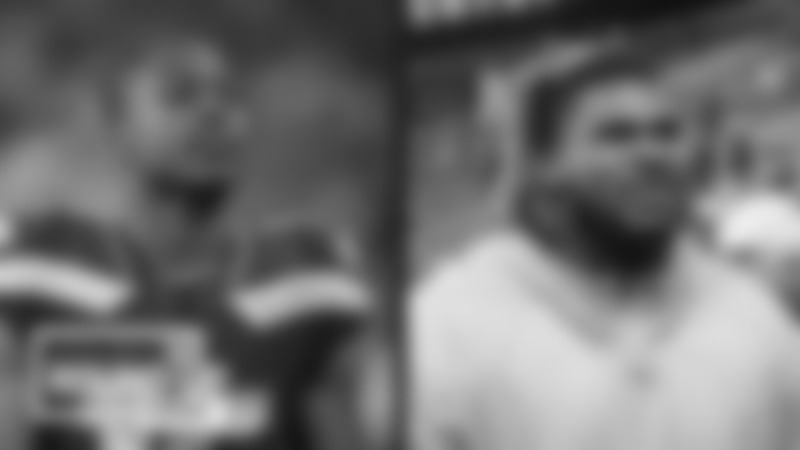 The writing staff at 710 ESPN Seattle recap a radio interview with Seahawks linebacker K.J. Wright after re-signing with the club. Re-live the Seahawks’ Week 3 comeback win over the St. Louis Rams in 2003 on the Seahawks channel using TuneIn. 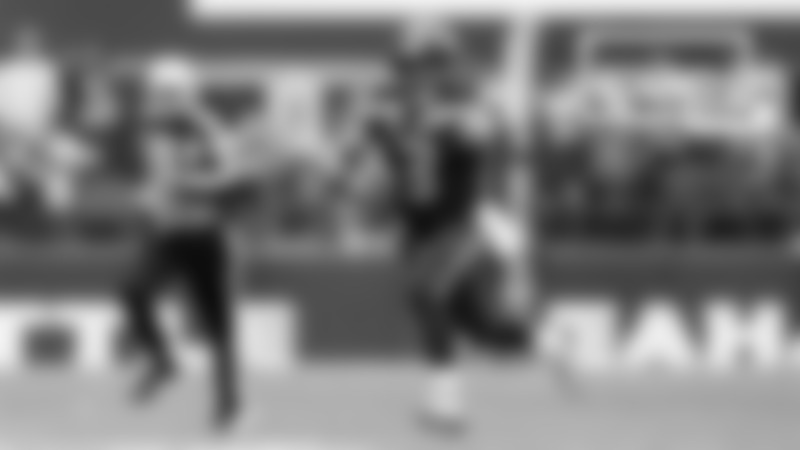 Every week throughout the offseason we will be streaming a throwback broadcast on the app. Download TuneIn here. 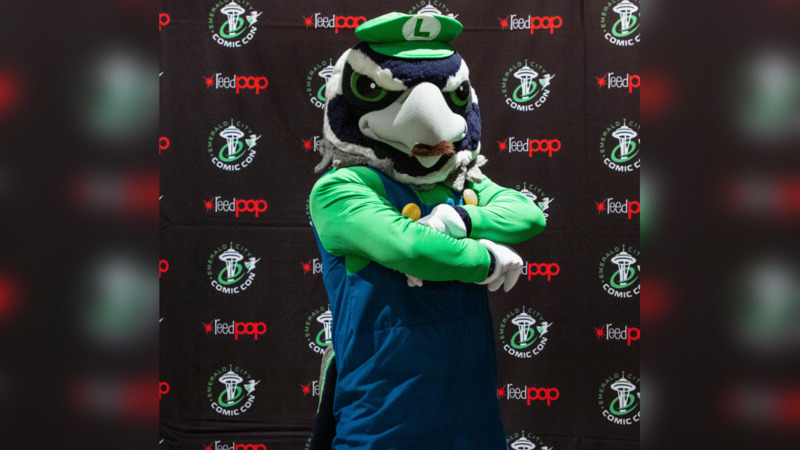 Dressed in costume as Luigi, team mascot Blitz the Seahawk paid a visit to 2019 Emerald City Comic Con held at the Washington State Convention Center in downtown Seattle.